US Secretary of State John Kerry has warned of a possible genocide in South Sudan if more peacekeepers are not rapidly deployed to end the conflict. 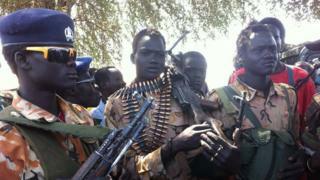 South Sudan had been hit by "ethnic, tribal, targeted nationalistic killings", he said. Rebel forces deny UN charges that they killed hundreds of people along ethnic lines after seizing the oil hub of Bentiu last month. More than a million people have fled their homes since December. Mr Kerry was speaking in Ethiopia after holding talks with African Union officials about the conflict. He is on a four-nation tour of Africa, which ends on 5 May. After talks with Ethiopian Prime Minister Hailemariam Desalegn, Mr Kerry also called for greater freedom in Ethiopia. "I am raising a very legitimate concern - we are concerned about any imprisoned journalist here or anywhere else," Mr Kerry said. Nine bloggers and journalists were arrested in Ethiopia last week, rights groups say. The US was pivotal in South Sudan gaining independence, so its opinion holds sway. Sanctions on individuals have become a popular international tool of pressure at the moment, but it is not certain if John Kerry will go that far. Presidents Barack Obama and Kiir got off to an uneasy start, and the latter has recently spoken against Western interference and the need for African solutions to African problems. It is a view supported by regional heads of state who will hold a mini-summit in Juba on Saturday, but they are expected to further pressure President Kiir. Can South Sudan be saved from self-destruction? Critics say the Ethiopian government does not tolerate any dissent. It is a close US ally in East Africa, playing a key role in fighting Islamist insurgents in Somalia. The UN has about 8,500 peacekeepers in South Sudan, which became the world's newest state in 2011 after seceding from Sudan. Last month's slaughter in Bentiu is said to have been one of the worst atrocities since fighting broke out in December between forces loyal to President Salva Kiir and his sacked deputy Riek Machar. The violence began as a power struggle between the two, but it later assumed ethnic dimensions. Mr Kiir is a member of the country's largest group, the Dinka, while Mr Machar is from the second-biggest, the Nuer. In Bentiu, non-Nuer South Sudanese, citizens of Sudan and even Nuers who were not celebrating the rebel arrival were singled out and killed, the UN says. The BBC's Alistair Leithead in South Sudan's capital, Juba, says 2,500 soldiers from Ethiopia, Kenya and Rwanda are expected to be deployed. They would have broader rules of engagement and would be allowed to use greater force to keep the two sides apart and protect civilians, he says. Foreign diplomats warn that the period before the troops arrive would be dangerous, our correspondent adds. Mr Kerry said he hoped that "in these next days literally we can move more rapidly to put people on the ground who can begin to make a difference". If the violence continued along ethnic lines, it "could really present a very serious challenge to the international community with respect to the question of genocide", he said. "It is our hope that that could be avoided,'' Mr Kerry told journalists. Ethiopian Foreign Minister Tedros Adhanom said regional governments agreed that a quick solution was needed. "There is an agreement that we have to be as aggressive as possible in order to have an impact on the ground in South Sudan," he said, the Associated Press news agency reports. However, it remained unclear, despite Mr Kerry's lobbying, whether the AU would send enough troops to South Sudan, AP reports.